5km west of Picketpost Mountain, Pinal County, Arizona. 24 Sept. 2017. 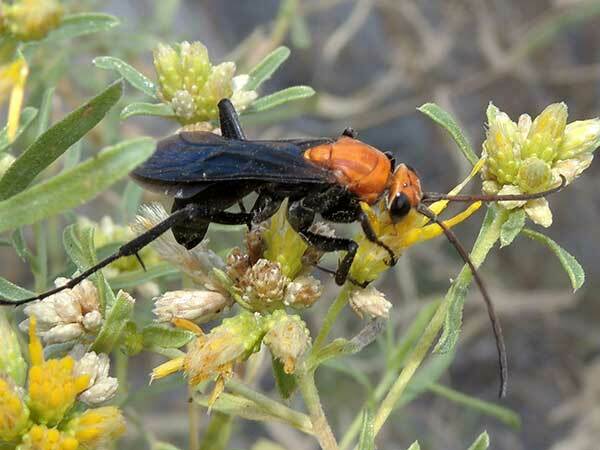 The nectar/pollen source is Burrobush (Isocoma tenuisecta). The nectar and pollen that female wasps gather from flowers is used to fuel their hunting activities. The female spider wasps do all the hunting. They hunt for spiders on the ground choosing a large spider such as a tarantula spider or a trap door spider. The spider is paralyzed with a sting before an egg is affixed to it. The hatching grub remains attached to the spider as it feeds on the spider's body. The spider finally dies as the wasp grub is maturing. Males are also frequently seen at flowers. Copyright Michael J. Plagens, page created 23 Nov. 2017.